This global agarwood essential oil market report provides data for the estimated year (2018) and forecast year (2026) in terms of both, volume (MT) and value (US$ Mn). The report also consists of macroeconomic factors, forecast factors, and a market outlook of the global agarwood essential oil market. The report includes a porter five force analysis of agarwood essential oil, and drivers, restraints, and trends of the global agarwood essential oil market. The porter five force analysis includes rivalry among competitors, bargaining power of buyers, bargaining power of suppliers, threat of substitutes, and threat of new entrants. The report consists of opportunities and current industry trends for agarwood essential oil. We have included a detailed competitive analysis, strategic overview, value chain analysis, and market key players in order to provide a comprehensive overview of the market to the users of the report. The report comprises a market structure that gives a detailed comparison between the local players, regional players, and multinational players of agarwood essential oil. The study provides the market attractiveness analysis by region, nature, sales channel, and end use of agarwood essential oil. During the detailed study of the agarwood essential oil market, our analysts observed that, there was a huge shift among consumers from conventional agarwood essential oil to the organic form, due to the rising health issues caused by synthetic products. This shift is likely to result an increase in the demand for agarwood essential oil throughout the forecast period. The report states that, the use of agarwood essential oil in the cosmetic and personal care industry is high, under which, the aromatherapy segment is expected to have a relatively high market share due to the high awareness regarding the healing properties of agarwood essential oil. Increasing consumer experimentation for unconventional health problem aiding therapies is supporting the growth of the agarwood essential oil and aromatherapy market. On the basis of region, the Asia Pacific agarwood essential oil market is expected to register a high market share during the forecast period, owing to the purchase of more agarwood essential oil personal care products. Following Asia Pacific, North America is expected to register the second-largest share in terms of revenue during the forecast period. The report also includes the company profiles of key manufacturers of agarwood essential oil, and the revenue generated by these companies across all the five regions - North America, Europe, Latin America, Middle East and Africa (MEA), and Asia Pacific (APAC). For revenue estimation, regional average prices were obtained through quotes from various agarwood essential oil manufacturers, distributors, and exporters. The key application segments of agarwood essential oil were all considered, and the potential applications were estimated on the basis of feedback from primary respondents and various other secondary sources. 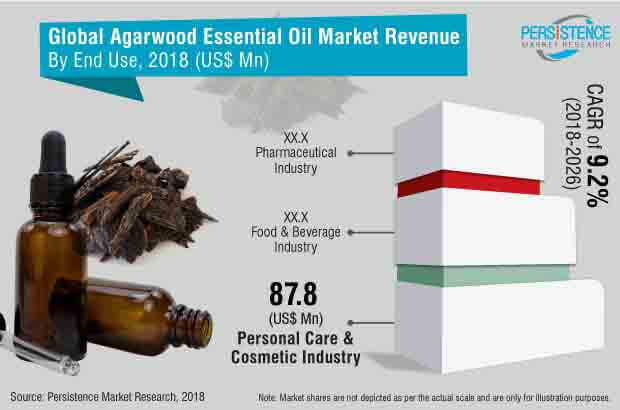 Some of the key data points collected for the modeling approach includes the overview of the food and beverage industry, region-wise outlook of the food and beverage industry, and average purchase of personal care products that consist of agarwood essential oil. The market was forecasted based on constant currency rates. A number of secondary and primary sources were conducted during the course of the study. Secondary sources include annual reports of companies, publications, Hoovers, and Factiva. The report covers the market dynamics related to agarwood essential oil, which includes the trends, restrains, and drivers that help grow each segment, and the opportunities in the agarwood essential oil market. The report also includes insights and analysis into the potential of the agarwood essential oil market in specific regions. Detailed profiles of the providers are also included in the scope of the report to evaluate their long-term and short-term strategies, product portfolio of agarwood essential oil manufacturers, and recent developments in the agarwood essential oil market space. Some of the key players analyzed are BIOLANDES SAS, Tien Phuoc Co., Ltd (Grandawood), Hoang Giang Agarwood Ltd., Dauper S.A, Katyani Exports, Gritman Essential Oils, Essential Oil Wizardry, Biofinest USA, Nusaroma, The Imperial Oud Co, Deve Herbes, HYSSES Pte Ltd., WEFIVE group, Asia Plantation Capital Pte. Ltd., Albert Vieille SAS, THE MJI GROUP, Agarvina Co., LTD, ASSAM AROMAS, and Edens Garden, among other agarwood essential oil manufacturers. Agarwood essential oil is a concentrated hydrophobic liquid containing strong aroma compounds of agarwood, and is extracted through various extraction processes such as the water distillation process and steam distillation process. Agarwood essential oil is extracted from the resin of the agarwood tree. Agarwood essential oil is used in Chinese and Ayurveda medicines for its various properties, such as a sedative, pain reliever, and digestive aid. Agarwood oil has purifying, transcendent, warming, and balancing qualities, and therefore, it blends well with other essential oils, particularly with sandalwood, rose, jasmine, carnation, and geranium. Agarwood essential oil is rich in anti-inflammatory agents and antioxidants. Agarwood essential oil is effectively used for skin problems such as acne and skin irritation. Agarwood essential oil also helps reduce joint pain and fight breast cancer. After the agarwood essential oil has been extracted, there are few aromatic compounds left in the agarwood. Those aromatic compounds are reduced into a powder form in order to use it as bakhoor or incense. These compounds are also pressed into statues due to religious significance. All the known agarwood producing trees are found in broader South and Southeast Asia, although there have been no recent, global population assessments for species of agarwood. Trade data suggests that, most agarwood exports involve Aquilaria species, but not all species of Aquilaria produce oud. Aquilaria malaccensis grows wild in a number of countries such as Malaysia, Myanmar, India, Indonesia, Bangladesh, Bhutan, Iran, the Philippines, Thailand, and Singapore. Most agarwood producing trees are found in Southeast Asia and South Asia. Most exports of agarwood involve the Aquilaria species, but not all the species of Aquilaria produce agarwood essential oil. The global agarwood essential oil market is expected to witness high growth during the forecast years. There is an increasing shift towards preventive healthcare that attracts health conscious consumers. This is one among the critical factors that drives the demand for agarwood essential oil. The European region is a major exporter of agarwood essential oil, in which France and Germany hold the top position. Following the European countries, the U.S., Brazil, and India are the other top exporting countries, which contributes to the overall growth of the global agarwood essential oil market. The cosmetic and personal care industry is expected to hold a relative amount of market share in the global agarwood essential market. Agarwood essential oil has anti-inflammatory properties, which helps soothe skin irritation caused by allergic reactions, sun burns, and bug bites. Agarwood essential oil also has antimicrobial activity, which helps fighting bacteria that causes acne and pimples. There are several antioxidants present in agarwood essential oil that help repair dead skin, making it glow. This is less likely to cause skin cancer. Among the various properties of agarwood essential oil, its antiarthritic properties help reduce the inflammation and pain associated with arthritis and rheumatism. The diuretic qualities of agarwood essential oil flush help out uric acid and other toxins from the body by promoting frequent urination. This helps reduce stiffness, swelling, and pain in the body. Due to the anti-inflammatory properties of agarwood essential oil, it helps calm cough caused due to inflammation of the sensitive tissues in the airway. The oil can be massaged on the chest and throat, which helps sensitive tissues return to their normal state.